DFG Warden-Pilot Gary Schales does a preflight inspection before every flight. California Department of Fish and Game (DFG) warden and pilot Gary Schales is in the Gulf of Mexico region helping search for oil and turtles. The Fresno-based warden-pilot’s missions have primarily involved mapping oil sheens and helping assess how the oil has affected sea turtles and their migratory patterns. Schales, 48, pilots one of DFG’s Partenavia aircraft, which has a large Plexiglas observation bubble on the front. It also has an extended range, allowing it to stay aloft for more than six hours. DFG approved the loan of the aircraft and pilot in response to a request from the Deepwater Horizon Incident Command. The responsible party, BP, will cover the costs of the pilot and plane. 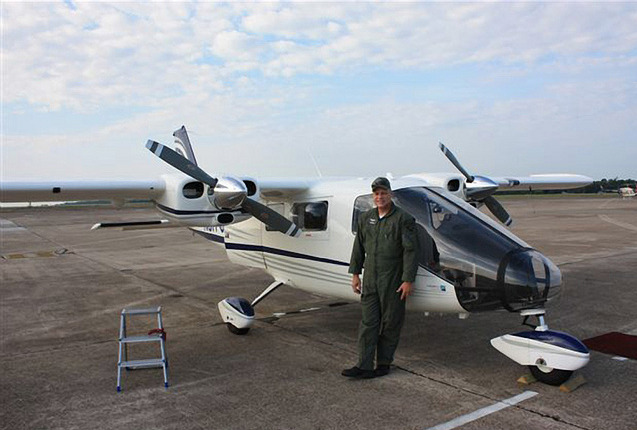 The specially designed observation aircraft is the only one of its kind being used in the Gulf of Mexico cleanup efforts. 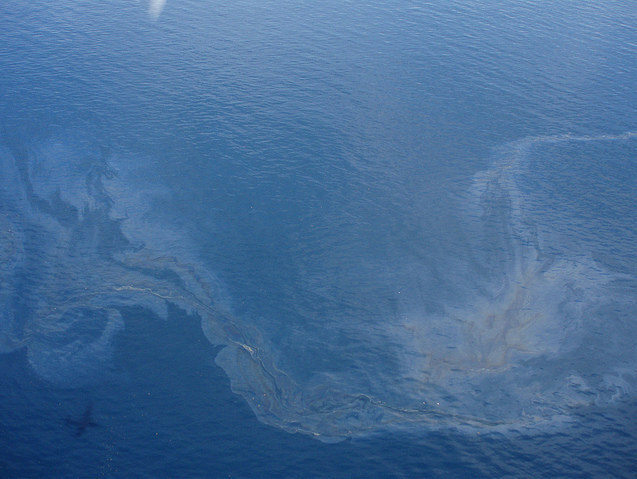 A shadow of the DFG airplane show up in the photo of a sheen approximately three miles from the Deepwater Horizon well. Warden-pilots like Schales are full peace officers who are not only pilots, but airplane mechanics and trained aerial observers specializing in both low- and high-altitude observation. They assist fellow game wardens on the ground or in boats in the apprehension of poaching suspects, and they also assist DFG with locating and tracking pollution, following telemetry, and pursuing wildlife, among other duties. Schales has been a pilot with DFG for 11 years. In addition to Schales’s deployment, DFG’s Office of Spill Prevention and Response has deployed more than a dozen staff members to the Gulf since May. These oil spill experts have helped with GIS mapping, wildlife operations, shoreline assessment, and various other duties. On April 20, 2010, BP’s Deepwater Horizon oil rig exploded, killing 11 platform workers and injuring 17 others. The explosion and subsequent sinking of the platform resulted in the release of millions of gallons of crude oil into the Gulf of Mexico. On July 15, the gushing wellhead was capped and the leak was stopped. Schales joined the response effort in late July and is expected to stay at least one more week.